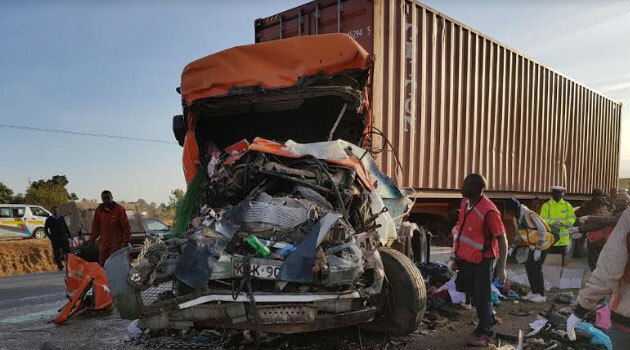 By DAVIS AYEGA, NAIROBI, Kenya, Jan 3 – National Assembly Transport Committee Chairman David Pkosing has said more needs to be done to streamline the transport sector following a spate of road accidents that have seen close to 200 people lose their lives in the last month alone. Speaking to Capital FM News on Wednesday, the Pokot South lawmaker said the National Transport and Safety Authority (NTSA) should focus on coming up with long-term solutions to curb the increased number of road accidents in the country instead of reacting whenever accidents occur. While citing the night travel ban issued by NTSA, Pkosing said that the ban was not a permanent solution towards solving incidents of road carnage in the country. “I support the ban but it is not a long-term solution. People travel at night across the globe and Kenyans should be allowed to do the same,” said Pkosing. Pkosing proposed the need for the government to move fast and build dual carriage roads especially on specific roads deemed as black spots. “The government should redesign the Nakuru-Eldoret highway through the construction of a dual carriageway and through that I believe the number of road accidents witnessed in that stretch will significantly reduce,” he said. The highway has become synonymous with horrific accidents that have claimed hundreds of lives over the years. The lawmaker however said that Francis Meja and his team at NTSA should not be disbanded saying changing of heads at the authority will not help the situation but what is crucial is the implementation of necessary laws. “What needs to be done is the implementation of laws that will help bring sanity on our Kenyan roads. Disbanding NTSA will be unwise,” he said. He further noted that once the committee commences its sittings it will propose stringent laws that will bar reckless drivers from driving on Kenyan roads and more importantly focus on ensuring that the buses carrying passengers are of high standard and quality. “We will also work closely with relevant bodies to ensure that the quality of buses that we have on the roads are of high standards and quality,” said Pkosing. In the meantime, the night travel ban has left many passengers especially school going children stranded in various bus stages across the country with many forced to travel between 6am and 7pm. NTSA banned night travel for all Public Service Vehicles immediately after Salgaa incident that claimed 36 lives.